last year i played a ton of games downloaded from the 3DS’s eshop, not even counting virtual console titles, and this year i’m already on track to follow a similar path. 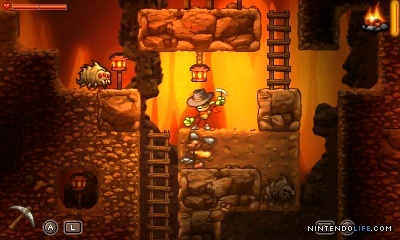 there’s a great variety of unique offerings, and after hearing rave reviews i picked up steamworld dig. the game has been pretty much universally described as dig dug meets metroid, and, being fans of both, it was an easy sell. the description doesn’t describe how fantastically polished the game is. every aspect of the presentation gleams and makes every movement enjoyable, even if the rest of the game were a bore. which it’s not. the game does take on the core dig dug mechanics, but being the main mode of movement it also has had to incorporate game mechanics to ensure you that you aren’t ever stuck and can’t climb back up, along with hugely beneficial power-ups that make navigation and loot collecting easier. the game itself feels a little constrained by its scope (basically three areas and only one boss) since it feels like the world is so lively and the mechanics are so solid that an even more-epic game is just aching to get out. but even with its relatively short gameplay (roughly 5-6 hours if you don’t rush) this is a wholly enjoyable game. the real highlight of the game, though, beyond the dig dug-like (and at times drill dozer-like) gameplay and the metroid-like exploration and power-ups, is the 8 mini-caves. these are rooms you enter off of the main areas and house essential power-ups, and each is self-contained but easily provide the game’s most interesting and satisfying moments. these caves include unique setups, such as routes that require specific timing or levers that have to be found and activated, and provide a great break from what gets to be routine digging and exploring. i would’ve preferred more of this type of gameplay and a bit less of the routine digging, but that’s a small nit-pick in what is otherwise an almost uniformly enjoyable experience. it’s a bit hard to identify why this game didn’t quite make my list of all-time greats, because there’s so much i enjoyed about it. backtracking to the surface can get a bit tedious, but that wasn’t a major problem. even though i played through it all in just a few sittings, it just didn’t quite have the elusive “it” factor that made me feel it was a “life-changing” game-playing experience. my bar is pretty high, though, so there’s no question about me whole-heartedly recommending the game, as i’m sure once you play it you too will be left waiting impatiently for the sequel (which apparently is in the works, along with another title set in the same universe).